People will tell you, shaving is an art. The perfection of it is dependent on the performance of the shaver. When it comes to manual shavers, performance depends on the hands that operate them. Let me tell you: It’s easy to compare between two rival brands. Differences become clear and there’s a clear favorite as well. But when it comes to comparing products of the same brand and the same series, things become tougher. For example, analyzing Braun Series 3 ProSkin Reviews and comparing different machines is not easy. People need to spend countless hours shaving with these machines to find out the tiniest of differences. Fortunately, I’m here to get you out of this predicament. I’ve had my fair share of shaving with these tools. In this little article, I’ll be looking into four of the prominent series 3 shavers and analyzing their features, benefits and differences in great detail. Hop on the train and let’s enjoy the ride. 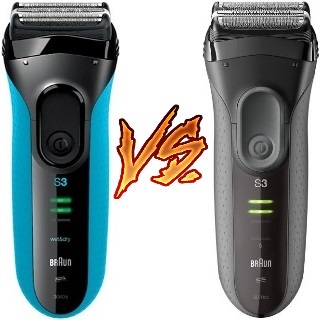 How Did Braun Electric Shaver, Series 3 ProSkin 3040s Turn Out for Me? 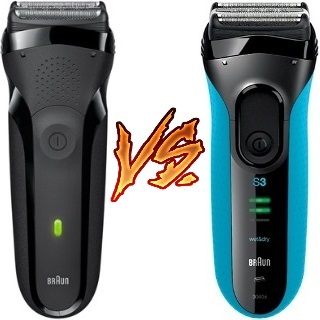 How Did the Braun Series 3 300s Men’s Electric Shaver Go? 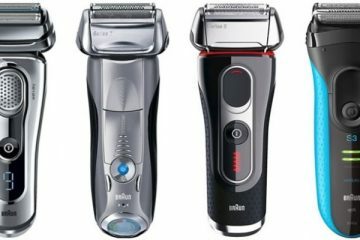 What are the Similarities I found Across All Braun Series 3 Shavers? Alright! What Are the Differences? Braun 3010s vs 3040s: What’s the Difference? The 3040s is one model I tried my hands on initially when I switched to Braun from a less reputed brand. I must say, I was impressed by the overall build of this unit. The compact size is perfect for my medium-size hands. Also, you have the textured grip that prevents this unit from slipping up when shaving in shower. There’s a magic in the works when I’m shaving with this kit. That is, the “Micro-Comb” technology. There’s a small comb in place which catches and feeds more hair into the blades. As a result, I can shave better and faster with this device than with my previous shaver. This is a foil shaver that works with three cutting elements. Have you heard about SensoFoil? It’s the technology responsible for protecting our skins against rubbing, nicking, and cutting due to using super sharp blades. ProSkin 3040s comes with two Sensofoil blades. Yes, the cut while protecting the skin. One thing I noticed is that the blades can retract when needed. This way, no matter how much pressure you put on the blades, the skin won’t feel anything too serious. Yes, these are pressure sensitive. The third cutting element is the trimmer. It sits right in the middle of things. It’s quite handy when it comes to taking care of the delicate areas of our face and body. This is all thanks to a precision head that’s designed to move to whichever spot you want it to go. People can trim mustaches, sideburns, style their hair on the back of their heads, and do a lot more with this attachment. It’s there at the back of the shaver. Just push a button and it’ll come out. Push it again and it’ll retract on its own. No hassle whatsoever. Series 3 shavers (3040s too) are waterproof as well. You can expect it to perform normally even when it’s under water by 5 meters. Naturally, people can use this tool for wet shaving as well. Don’t worry, you can utilize shaving gel, foam, and cream in tandem with 3040s like with other top brands that are out there. This will yield the best results when it comes to wet shaving. I’m a big fan of the Ni-MH battery. People will get two of them with a charging cable. You’ll have 45 minutes of runtime after the machine is fully recharged. Wet and dry shaving is a blessing when you consider the price and the Braun brand. It’s a beginner-friendly machine. Pair it with a good shaving cream and enjoy shaving. Textured grip prevents it from slipping out of my hands when I’m wet shaving in the shower. The overall build seemed compact in my eyes. Perfect for people with small & medium hands. This waterproof device stays good even after three years of rigorous usage (my experience). You don’t get the charging dock with this model. It’s expected with such a low price. If you’re used to handling devices with a longer cordless duration, 45 minutes won’t seem much. One thing I learned is the fact that the outer makeup of these Braun Series 3 Shavers are “Almost” the same. It’s the benefits that are different. For example, you get 20 minutes worth shaving out of this model compared to the 45 minutes you get from the earlier one. That’s a huge plus. People will get to have as many as 5 different shaving elements as opposed to three in the case of the previous tool. These modes are pressure sensitive as well. Sonsofoil helps the blades to retract if you push too hard on your face or body. It helps to sense the contours of our faces and act accordingly. As a result, there wasn’t any nicking or cutting when I used this tiny shaver on my face and body. Other brands gave my skin red spots and rashes after shaving. With Braun Series 3, I didn’t even need a moisturizing aftershave to cover for my mug. That’s how I like it! The flexible head plays a big part in the navigation of these foils. One good thing is the fact that users can remove the shaver’s head. This feature comes in handy when you need to clean the tool. My advice would be to replace the foil shaving head from time to time to maintain top notch performance. The control panel is quite simple. You have the on and off switch and that’s it. There’s an indicator that lets you know about the status of the four batteries you get. Glowing LED lights flash either green or red. Yes, you heard it right. There are four NiMH batteries on offer with this machine instead of the two. Two extra batteries do a world of good to the model. I could muster up 45 minutes of cordless charging time with one full charge of the machine. These batteries retain charge when not in use. No memory issues! Users will have to charge the device for an hour in order to use it cordless. You’ll have the cleaning and charging dock with this model. The dock lubricates the foil blades when the device is not in use. The signature “Textured” grip is also on offer in case of this model. It helps when you want to do wet shaving with this model. When shaving in wet conditions, I advise people to use a good shaving foam or gel to get the best out of Braun 3010s foil shaver. I intentionally kept MicroComb technology away from the spotlight till now. As you know, this technology allows Braun 3010s to capture all size of hairs quickly and efficiently. Yes, even 3-day old beards are just fine. As a result, the users won’t face difficulties in shaving long or short beards. People can use this device while in shower or right before an important meeting of theirs. Four NiMH batteries deliver 45 minutes of cordless shaving. It’s enough for three shaves. This is a budget shaver available to you at a price of under $50. The performance corresponds. The 5 different shaving elements grant people a variety of styling and options to indulge in. The machine is fit for wet and dry shaving. It shaves faster than any of its rivals out there. You don’t get a trimmer with this model and have to do with only the shaving elements. If you want a shaver that truly does what it says it does, get Braun ProSkin 3050cc. Any proper Braun Series 3 ProSkin Review will tell you that the cleaning station got a significant upgrade in this version. The cleaning dock works with Alcohol and in three stages. The 3050cc has a cleaning indicator which flashes when the machine needs some maintenance job done. As a user, I was never in the dark about the state of the blades and the overall razor. Cleaning it is easy. Just dip it in the cleaning solution for a few minutes as alcohol washes away all the skin oils and strands of hair (if there are any). The dock even charges this tool. Also, blade lubrication is also done through this station. But my advice to you is do a manual cleaning twice a week. As the razor goes, it feels light in weight when taken in hand. The measurement of the body is quite consistent unlike their Panasonic counterparts that taper towards the middle. No, it won’t hamper the overall ergonomics of the model. It still is easy to grip and use consistently. I liked the protective cap. The cap begins from the shaving head and extends to the power switch. This thing acts as a travel lock as well. Thanks to this, you don’t need to worry about 3050cc acting on its own when you’re on a vacation and it’s inside the luggage. I got to use this shaver in corded and cordless manner. Yes, the users get to charge in two ways. By plugging it to a cord and an electric outlet and by using the cleaning station. Either way, it takes 60 minutes for this unit to get fully charged. Average battery life for this model is 45 minutes. Yes, you get the “Quick Charge” option which gives people enough juice to conduct one quick shave. This is thanks to the two Lithium Ion batteries. These batteries even hold the charge for a long time. Going back to shaving performance, you get as many as three different modes of shaving. As usual, Sensofoil technology is also there as a trademark of this series. The blades are super sharp as well. The Sensofoil technology protects our skins from getting nicked, cut, and bruised due to quick shaving. The shaving head moves along the contours of our faces. I could change the shaving head as well. Changing of the shaving heads is quite a task I’ll tell you that. 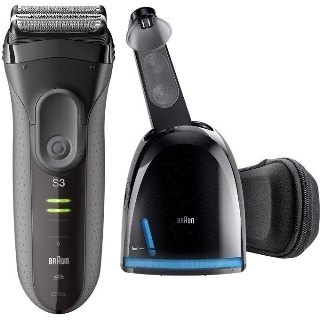 Braun Series 3 32b replacement shaving head is exactly what you want as a replacement part for this accessory. While I’m on it, I’ll briefly touch on Micro Comb technology that catches long and short hair strands alike. This allows the users to have a smooth and comfortable shave. 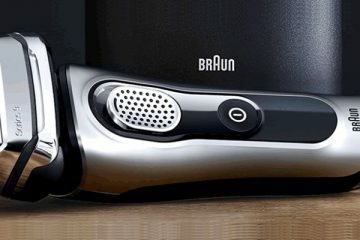 The trademark “Dotted” grip of the Braun Shavers is also present here in the case of 3050cc. It helps when you’re trying to grip it with wet and/or sweaty hands. My only beef with this model is that unlike the earlier two, you can’t use it for wet shaving while being corded. Don’t get me wrong, the device is waterproof. It’s just that when you’re using it while plugged in an outlet, the shaver reverts to “Dry Only” operation. 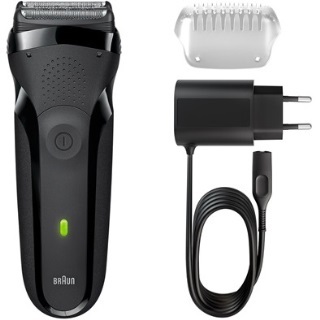 The Braun 3050CC comes with a sturdy build and a motor which makes the razor noiseless. You get the cleaning base with this model. The cleaning base helps you maintain the shaver. The shaving head is competent. Replacing it also inexpensive and easy on your wallets. This little razor is waterproof and comes with a travel lock/protective cap for the shaving head. You’ll find the 3050CC to be great if you have a sensitive skin thanks to three different modes. This thing is not the fastest shaver around when compared to Panasonic Arc 3. The size of 3050CC makes it a bit hard to maneuver this shaver under the nose and ear. 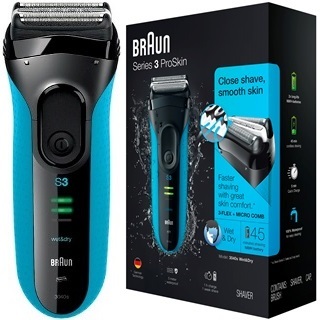 If you want something cheap which retains most of the signature features of Braun Series 3, get the 300s Men’s Electric Shaver from the lineup. Yes, you get the Micro Comb technology at your disposal. It helps you by capturing different lengths of hair. As a result, the shaver cuts long and short hairs alike. Despite this being a low-priced model, you get three blades that cut well and respond to the contours of your face and body. When applied with pressure, these 3 blades retract to sustain the pressure. This way, the blades stay clear off the skin even when cutting the facial hair. As a result, people won’t feel rashes or bumps on skin. No nicks, cuts, and bruises as well. I found Series 3 300s to be great on my sensitive skin. Yes, it’s an “Entry-Level” model. Yet, the device shaves competently. This is thanks to the three distinct shaving modes that Braun Series 3 has at the very least. Another good thing I noticed in this model is the fact that the shaving head could adapt to the contours of my face as well. The Sensofoil blades flex to accomplish that. This is different to the blades retracting. Of course, people can change the shaving head when it wears out as well. Even this “Entry Level” 300s model, I found two NiMH batteries. These batteries grant Series 3 300s a 30-minute shaving time. No matter the shaving time, the batteries can retain the charge. You won’t find any memory issues with this unit as well. Even if anyone uses it after a month or two, it should be fine. I could use it corded and cordless. It receives charge very quickly. One thing that interested me is the smart plug. It’s an adapter that switches back and forth between 110V and 240V when users need it to. Thanks to this, people will be able to use Braun Series 3 300s outside the USA as well. Two thumbs up! You don’t get a pop up trimmer with this thing. Trimming your sideburns or mustaches would be some kind of work with this model. I’ve not seen people use this on their body as well as face and head. But I’ll say this: Barbers use Series 3 300s to good effect and do hairstyling and cutting efficiently. You get a cleaning brush as a part of the package. Use this for a bit of manual cleaning. While you’re at it, make sure to apply some soap on the foils and run tap water over the unit. Experts suggest people to change the blades every six months to keep the top-notch performance up. Sensofoil technology will protect the users’ skins from bruises, rashes, nicks, and cuts. This “Entry-Level” shaver has flexing shaving head that adapts to the contours of people’s faces. This model doesn’t vibrate as many of you will find out while using 300s on a daily basis. The dotted grip from Braun works like a charm. I got plenty of traction when working with it. For a beginner-friendly shaver to offer 30 minutes of shaving time is great in its own right. I didn’t find a travel bag with this unit. I had to come up with my own back to pack the items. This shaver is the slowest of the bunch. Takes time while shaving long hair strands. A lot of it. Ooh boy! Where to begin? Since these tools are a part of the same series, you’ll find plenty of similarities between them and I mean PLENTY. Let’s chop the branches one by one to get the tall tree down. I mean, let’s discuss the similarities one by one before getting to the differences of each model. 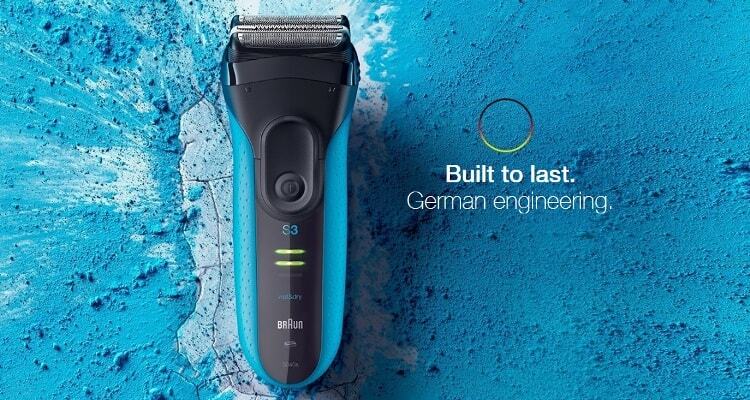 Braun series 3 comes with multiple shaving modes. All these modes are gentle on your skins. No matter which model you buy, you’ll have at least three modes to play with. The motor is super competent itself. By that, I mean users will be able to switch through speeds comfortably. Of course, the latter models like 3050cc has as many as five models. But even the beginner-friendly models like the 300s have at least three modes. The best thing is, the motor Braun uses is quiet. No matter which speed or mode you operate with, series three shavers won’t make a deafening noise. Braun is famous for a number of tricks in its bag. One of them is the “Micro Comb” system. This thing allows the razors to grab and supply hair to the foil blades at a quick speed. No, you won’t find the shavers pulling or tugging on the skin. There won’t be any rashes either. People don’t really use electric shavers to shave off 3 – 5-day long beards. With Braun Series 3, you can. The technology helps in catching long and short beards alike. As a result, you’ll be able to shave fast and effectively without switching through products for different hair types. You’ll have three foils that have mesh covering the blades underneath. These three foils do the shaving, trimming, and cutting of the hairs. These foil blades can adapt to our facial contours. When people apply too much pressure, these blades retract to make way for and discharge the pressure elsewhere. Along with the blades, the shaving head flexes as well. This thing comes handy when people decide to shave their body hairs and skull. Our bodies have steeper angles and more difficult contours than the faces. That’s why we need a flexing shaving head to depend on. All Braun Series 3 ProSkin Reviews will tell you that these models are quite adept at that. Also, you can change the shaving head whenever you want. The foil shaver of series three are equipped with competent blades as well. These babies are sharp. By sharp I mean, they don’t lose their edge that often. Of course you need to clean the blades to maintain their edges and the way they perform. Braun takes care of the that as well. People will have the luxury of a cleaning brush with all the models. Advanced models like 3050CC come with a cleaning/charging dock as well. Feel free to run a manual cleaning session twice a week with the brush. In fact, I’d recommend that over the cleaning dock. The cleaning dock works by conducting a 3-stage cleaning process with alcohol. This has its own benefit as well. Alcohol lubricates the blades and makes them ready for the next shaving session. But as I said, three out of the four models here don’t have the dock available. So, run manual blade cleaning sessions. One thing I can say with my eyes closed is the fact that Braun grants its electric shavers power. Be it in a corded or cordless fashion. These shavers that I have for today’s article have competent batteries powering them. The NiMH batteries can give you 20 minutes to an hour of cordless operation. Charging these babies is easy as pie as well. Just plug them in an outlet and you’re done. These batteries receive charge in quick time too. Half an hour to an hour is all that people need. Braun even bestowed the models with “Quick Charge” system that allows users to recharge these shavers for one shave only. Most brands often limit the capabilities of cheap shavers. For example, some brands have below $50 shavers that are fit for dry shaving only. You can’t use foam or shaving cream with those. But with Braun Series 3, every shaver is designed to work on dry and wet conditions. I used mine while in shower. The inevitable fact is; these shavers are waterproof. Not repellent, waterproof. Expect these to function well even after being submerged in water. These tools should work fine even if you drown them 5 meters deep into water and pull them back up. Thanks to the housing, water doesn’t get inside. We’re done with the similarities between these four devices from series three. It’s time to get into the nitty and gritty. Let’s analyze the things that differ in each of these tools. Since there are four models, let’s do a one vs. one standoff between them. When comes to these two models, we don’t really find major differences that would shock us in terms of the looks. Dive a bit deeper and it’s a different story. For example, you get as much as five different shaving modes and speeds to play with when shaving with the 3010s. I don’t know why this is the case but 3040s actually has lesser modes. By that, I mean only three. The performance differs ever so slightly as well (you expect that with two less modes to work with). Also, the 3010s doesn’t have a “Pop Up” trimmer to be honest like that of 3040s. Instead, you have a trimmer that you can attach by taking the shaving head off and putting the trimmer in its place. The 3010s is lighter than 3040s by a fraction. Also, the 3010s is slimmer than the big brother that is 3040s. The rotary motor of both the shavers weigh different. That’s why the difference. The last thing I found differentiating is the battery. The charging time you get with each of the two razors is the same. It’s 45 minutes’ worth of juice after an hour of charging. The quick charging duration is also the same. What differs is the number of the batteries. The 3010s comes with four NiMH batteries. 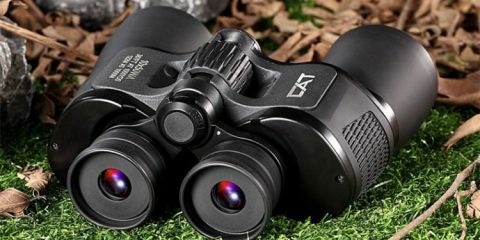 We see 3040s with just the two built-in batteries. I guess the extra power goes in the extra three modes that we get with the earlier version. There are a few minor differences related to the designs of these products as well. My personal favorite is 3040s when comparing the two. The first thing I noticed in case of 3050cc is the advent of a cleaning station. Braun’s series 3 3040s doesn’t have that. You get a three-stage cleaning station with Alcohol as the cleaning agent. You get to clean the blades and lubricate them. Also, feel free to dock the shaver for charging as well. You don’t have to buy a lubricator separately to maintain the blades any longer. But changing the cleaning solvent of the station (which is readily available) from time to time is necessary. Again, not too frequently and it requires lesser price than buying a lubricator. 3050cc is pressure sensitive as well. Don’t get me wrong, the model we’re comparing this to, has retractable blades. But not to the extent of the 3050cc. While shaving with the latter, I didn’t even feel the shaver working on my face let alone scratches, tugging, and pulling. The 3040s is perfect when you use it with the cord plugged into an outlet. Although its big brother comes with a charging station, it can be recharged with a power cord as well. But unfortunately, users won’t be able to use the device while it’s plugged in and is receiving charge for the battery. I found the latter model to be an improvement on the design for Braun Series 3 shavers. Yes, you can maneuver 3040s through the tough corners of your body and faces. But 3050cc takes it a new level. You can even trim the hairs around the noses of yours with the precision trimmer and the blades provided. There’s a significant improvement when it comes to batteries as well. I found 3050CC to have two Lithium Ion batteries instead of the NiMH ones. 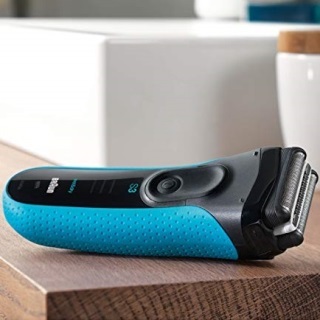 What this does is enables the shaver to hold on to the charge for a longer duration. You won’t find any memory issues with the batteries whatsoever. I do think the price difference counts as a difference as well. While the 3040s hovers at a price near $50, you’ll have to pay ALMOST double for the 3050CC. The price is more or less $100. It’s justified since you get the cleaning station and long living Lithium Ion batteries for the price. The first thing you’ll notice between these two cousins is the difference is design. To me, 300s looks pretty basic with the black outer case. Both the casings are strong and they do hold up for a long time. But when it comes to an additional feature of a trimmer, 300s sells you short. No, you don’t get the “Pop Up Trimmer” with 300s. This is a bummer as people will have to be extra careful when shaving around the ear, sideburns, nose, and styling the beard. One thing I found interesting in the 300s is the Smart plug. Yes, people can use it when its charging and is plugged in an outlet. But the beauty of it lies in conversion. The adapter switches in between 110V and 240V whenever you need it to. Travelling with it and using it outside the USA is a breeze. I’ll give it to 300s. It’s lighter than 3040s by a fraction. But the bulky design and a single LED indicator is easy to miss when you’re monitoring the battery levels. It can be a bit noisy in comparison with 3040s. The difference lies in the batteries. You get the same number of in-built NiMH batteries. But the 300s can work for 30 minutes at the maximum charge. The 3040s works for 45-minute at a stretch with a full charge. The quick charge system is more or less weak in case of 300s as well. I wouldn’t advise people to use it when wet shaving. Don’t get me wrong, you get the waterproof model. But the head and the blades flex. They can slip when shaving a wet face. So, the recommendation is purely on the basis of performance which is not too great to be honest. Phew… Finally, I’m done with the reviews, similarities, and comparative analysis of these products. 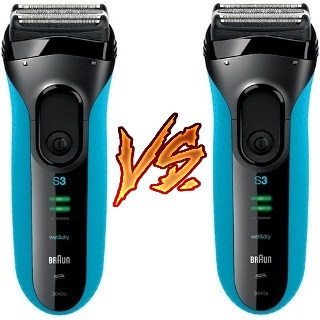 As it turns out, these shavers are pretty close to each other when it comes to features. The only shaver bearing a stark difference is 3050CC. You could say that the 300s is the “Entry-Level” model out of the four. 3010s and 3040s sit at the middle. If one’s looking for performance and a bit of comfort when it comes to price,3010s is the optimum choice. But if you have money to spend and want a class product out of the four, go for 3050CC. People who’re just getting into Braun as a brand, should try their hands at either 300s or 3040s for starters. Get to know the brand and the features a bit better before jumping up in the series. 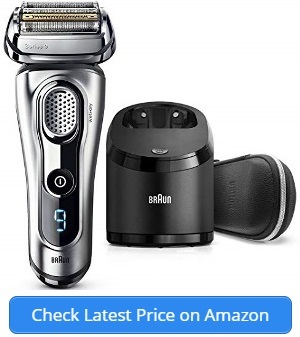 Whatever you do, make sure to go through individual Braun Series 3 Reviews to get to know these products a bit better before making the purchase.